Paul Miller made the majors in 1991 with the Pirates, but it's how he got there, or at least where he started, that gained notice. Miller got there after starting as the Pirates' 53rd round pick in the 1987 draft, the club's final selection, The Pittsburgh Post-Gazette wrote. "I joke a lot with the guys who got the big bonuses to sign and have their cars paid for," Miller told The Post-Gazette after his major league debut. 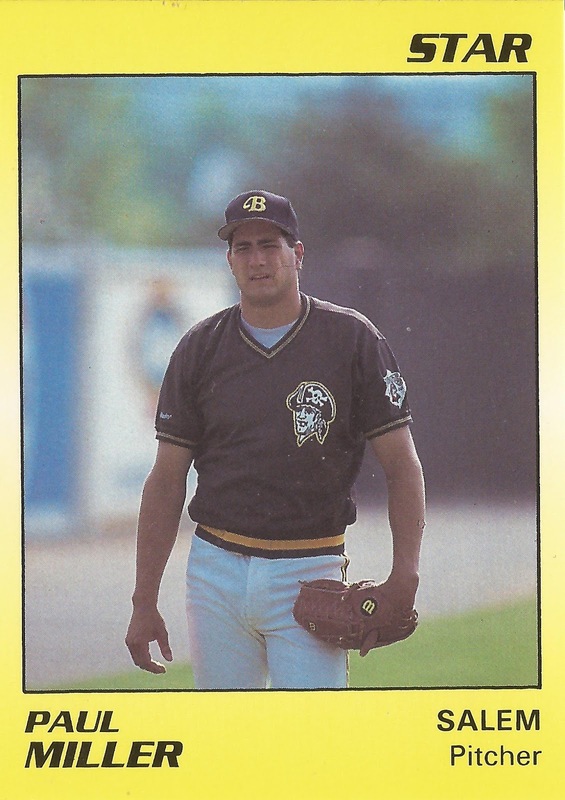 Miller pitched in a single game with the Pirates in 1991, but he returned in two more seasons. By the time his career concluded, that 53rd-round pick had seen a total of 10 major league appearances, three starts. Miller's career began that year in 1987, taken by the Pirates out of Carthage College in Wisconsin. Miller started in the rookie Gulf Coast League. He went 3-6 over 12 starts, with a 3.20 ERA. He then moved to single-A Augusta for 1988 and then single-A Salem in 1989. He first made AA in 1990. He got five starts at Harrisburg, where he went 2-1, with a 2.19 ERA. He played the rest of the year at Salem. Miller returned to Pittsburgh for six relief outings in 1992. He gave up three earned in 11.1 innings. He then underwent shoulder surgery. He made it back for three more games at Pittsburgh in 1993. He gave up six earned in 10 innings. He played in one more season in the minors at AAA Buffalo in 1994. He spoke of his frustrations returning from his surgery to The Buffalo News after a seemingly rare good outing. "I don't know if I'm a slow healer or what, but it's been a nightmare to get the arm going again," Miller told The News. "Tonight I thought I had a decent fastball and that makes you a lot more aggressive. When you're getting lit up with your fastball, you tend to crawl in a shell." Miller went 3-6 overall for Buffalo that year, with a 4.91 ERA in 13 outings, nine starts, to end his career.